Watching Olbermann Watch: New Colors! After Becky at ERT graciously linked us we got two new comments and decided it was time to pay attention to the site again. We've added some cool elements to the site including a random collection of Keith Special Comments on YouTube and other doo dads. There is a poll where you can vote on the new color. If everyone hates it I might consider green. I have not looked at Olbermann Watch in a while but reading through the comments it sounds like Cox is back to his fascist ways. He has been banning anyone who criticizes the usual suspects and then bans anyone who complains about the banning. Sound familiar? What has to be really driving the wingnuts at OW crazy is that our beloved Keith is now blogging at Daily Kos and getting more comments in one post then Olbermann Watch gets in a week. Keep it up Keith. Tip of the Day: Colorado Bob has a link to Countdown Podcasts for PC, iTunes or Zune. Cool! I love that Keith is blogging at Daily Kos. It is still amazing to me that we have "our guy" as the big dog over at MSNBC. Way to go, KO! 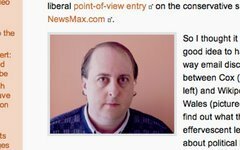 "Cox is back to his fascist ways..."
No, actually, Cox exposes fascism. And he exposes hypocrisy, lies, cowardice, and fraudulent journalism.